Auditions are held in the spring and fall for openings as they occur. For an audition appointment, please send your application to Kris Rudzinski via email or mail to Settlement Music School, PO Box 63966, Philadelphia, PA 19147-3966. 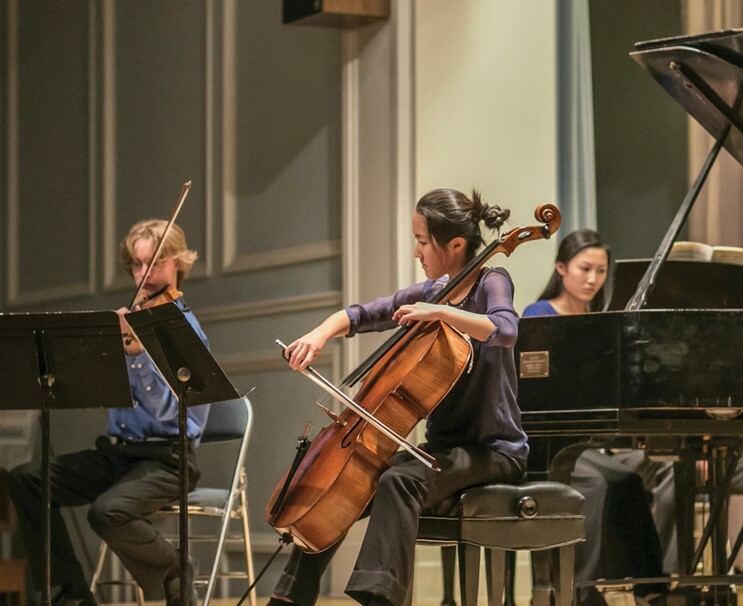 Settlement Music School’s Gray Charitable Trust Piano Trio, coached by Settlement piano and chamber music faculty member and Arthur Judson Distinguished Faculty Chair Sandra Carlock, performed at the 2016 Fischoff National Chamber Music Competition. The Trio, comprised of violinist Brenden Zak (age 18), cellist Cindy Yeo (age 17), and pianist Kelly Zhang (age 18), has performed together as an ensemble since 2013. The ensemble’s selection reflected a tremendous amount of hard work and dedication over the past three years, with preparation for this competition having begun at the start of the 2015-16 season. Numerous Settlement ensembles have been invited to take part in the Fischoff competition since its inception in 1973. Most recently, the Gail W. Snitzer String Quartet, coached by Sidney Curtiss, competed in 2014 and received an Honorable Mention.